Tarasov et al. have recently reported (Phys. Rev. Letts. 102, 142501 (2009)) the observation of 15 new isotopes that are the most neutron-rich nuclides of the elements chlorine to manganese ( 50Cl, 53Ar, 55,56K, 57,58Ca, 59,60,61Sc, 62,63Ti, 65,66V, 68Cr, 70Mn). Currently the neutron drip-line has been confirmed only up to Z = 8 with the nuclide 24O. Thereafter the drip-line shifts to higher higher neutron numbers. At Z = 9, 31F has been observed. For higher values of Z, the search for the neutron drip-line is even more challenging. These 15 new nuclides will appear in the next editon of the Karlsruhe Nuclide Chart. These new isotopes were produced by the fragmentation of a primary beam of 132 GeV/u 76Ge against 9Be and W targets using a recently developed tandem fragment separator technique. We have just deployed a new version of Nucleonica. You may have noticed that sometimes when logging into Nucleonica, it can take some time. The reason for this is that our web crawler service is non-operational for some reason. The web page is, however, waiting for the RSS feed to arrive – hence the reason for the delay. To resolve this problem, we have created a file to cache the previous News. If there is no response from the web crawler service, the News is loaded from the cached file. Hopefully, this issue has now been resolved. We have removed some bugs in webKORIGEN. The inhalation and ingestion radiotoxicities were calculated correctly only for the first 10 nuclides. Now it is correct for all 20 (most important nuclides). In fact, this is a good time to announce that we are currently removing this restriction of “top 20″ nuclides. In the next deployment, webKORIGEN will show all nuclides (up to 800) and all elements (up to 80). We will keep you posted. The group led by Sigurd Hofmann at the centre for Heavy Ion Research at Darmstadt (Gesellschaft für Schwerionenforschung, GSI) has just proposed the name “copernicium” for element 112 discovered in 1996. The elements was produced by fusing zinc atoms with lead atoms in a particle accelerator. To date the element had provisionally been allocated the latin name Ununbium, Uub (for 112). The proposed names still has to be endorsed by the International Union of Pure and Applied Chemistry (IUPAC). The currently known isotopes of Uub listed in the 7th Edition of the Karlsruhe Nuclide Chart are shown below with their half-lives. The colours denote the main decay modes (yellow: alpha decay, green: spontaneuos fission). 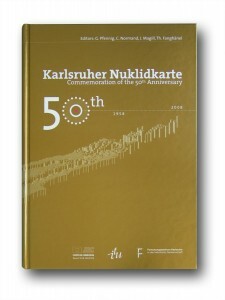 More information on the discovery of this new element can be found in the recent commemorative publication to mark the 50th Anniversary of the “Karlsruher Nuklidkarte”. This provides a broad, state of the art overview of scientific research in the nuclear sciences and in particular in the discovery of super heavy elements. The publication provides a broad, state of the art overview of scientific research in the nuclear sciences. Chapter introductions were written by R. Bimbot (France), M. Lewitowicz (France), B. Jonson (Sweden), G. Audi (France), S. Banerjee (India), R. Leonardi (Italy) together with Nobel laureates J. I. Friedman (USA) and G. ‘t Hooft (Netherlands). In total there are 30 scientific articles covering fundamental and theoretical aspects of nuclear physics and chemistry including the discovery of new elements and decay modes, neutrinos, quarks, antimatter, and dark matter. Technological developments are described in a series of articles ranging from space radiation biophysics and health care to archaeological dating, forensics and cultural heritage. We are considering introducing a Nucleonica Blog which should help to keep users informed on the latest developments. We currently have a number of pages in the wiki which provide News (Nucleonica News Archive), Hot Topics, Training Course Announcements, Latest Publications, etc. The contents of these pages could be combined together in a single Nucleonica Blog to provide a simple, very accessible and very appealing “diary” of latest Nucleonica developments. The blog would also allow fast access to new pages and historical items. Apparently the “secret” of the success of this Web 2.0 tool can be found in the knowledge management phenomena of “Storytelling” in which the “diary” entries are written like short stories. We are currently looking into the open source BlogEngine.NET project (http://www.dotnetblogengine.net/). This seems to be good, easy to use, and particularly suitable for .NET developers. Furthermore it also provides a number of extensions such as for Youtube videos, Photo Gallery, Voice and similar other features. However there are alternatives such as Movable Type, TypePad, and WordPress. These seem to be the industry standards (although not optimum for .NET applications). We are still having problems with access to the wiki. Colleagues from Ege University in Turkey and from the Federal Office of Radiation Protection (BfS) in Germany still cannot access the wiki. Latest news is from Dr. Ceren Kütahyali from the Institute of Nuclear Sciences in Ege University. She has contacted her university computing service who replied that Nucleonica wiki uses the “port 81″ (the wiki web address is www.nucleonica.com:81). It appears that many organisations (also here in Germany) block this port for security reasons. Hence, some users cannot access the wiki. Our technical staff tell us that the reason for introducing this port 81 in the first place was as follows: the wiki runs on an Apache server and Nucleonica on IIS. That’s why they had to change the port for the Wiki (as the two servers cannot run on the same port). It would be possible to also install the Wiki on IIS (this is however much more complicated than using Apache, but could be done) and use another virtual directory (for example www.nucleonica.com/wiki). A simpler solution appears to be to obtain another domain and let it point to the current wiki url. We are currently looking into this possibility and will keep you updated. It is now possible to order the Karlsruhe Nuclide Chart through our online shop. For further information see our Ask an Expert page. A new version on Nucleonica has been deployed today with some minor bug fixes. A new feature in the webKORIGEN module is that the user can now see the log file – i.e. the original fortran output files for the particular calculation. This log file is of use when checking the details of a calculation. Another new feature is that the Nuclear News RSS feeds are cached to a local file. In the event that there is a delay in the news crawler sending the latest news (which then causes a delay in accessing Nucleonica), the cached news items are used to construct the News. Once again we seem to have problems with access to the Nucleonica wiki. Our users from Ege University in Turkey (Ceren Kutahyali and colleagues) have reported that they have no access. On previous occasions it was sufficient to update or re-enter the password in the Edit Preferences on the Networking page, but this time it did not work. We have now passed the problem over to our maintenance support team and hope to have the issue resolved as soon as possible. We will keep you posted on this issue.